An Affiliated Group of the Society for International Folk Dancing (SIFD). Place: British Legion Hall, Victoria Grove, Bridport DT6 3AD. The club had its first meeting on 20 October 2011. Although Monty and Mecki did some publicity in the area, most people attending came because they had heard about it over the local ’dancers’ network’. Mecki had prepared quite a list of dances she thought would be reasonably easy; in the end, the group were introduced to four dances. While we started with simple dances, like Pravo Oro and Davorike Dajke (one of Yves Moreau’s dances recently learned), we also tackled a fast dance, Daichavo Oro, cheating only a little by having reduced the speed of the original recording. And to prove that even a beginners’ class is capable of learning a relatively complex dance, we attempted Karamfil and were very satisfied with the results. Everyone seemed to enjoy the music and there was certainly a sense of achievement and satisfaction at the end of the class, when we danced all the dances one more time. There was a chance emphasis on Bulgarian dances, as Mecki had recently attended a Bulgarian dance workshop and those dances were still fresh in her memory. The intention is, however, to have dances from all the Balkan countries, some French and Isaeli, and from countries further afield. The club will do mainly non-partner dances. 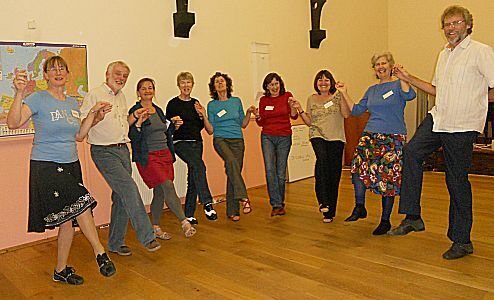 Naturally, the club is to provide enjoyment first and foremost by introducing people to a wide variety of tunes, rhythms, traditions and styles and to pass on a love of international folk dancing. Mecki will always pass on as much information as she has available about the dances, where they come from and why they were danced. She is not a qualified dance teacher but did study to be a teacher many moons ago. As the club is affiliated with the SIFD this will mean guest teachers a few times a year. A further plan is to have live musicians now and again. If you know of anyone who would be interested to volunteer, please put them in touch with the club. Evening Dancing .... I am considering offering a daytime class as part of the "fit as a fiddle" project, funded by Age UK. I'll let you know if that happens.